We are on a quest to find great recipes in which to use our hot peppers. I like a spicy ketchup, and I like spicy barbecue sauce. I read about peach ketchup some time ago and thought it would taste good with habaneros. I've adapted this recipe from a number of peach ketchup recipes I saw on the internet. In a large stockpot, bring peaches, champagne or white wine vinegar, brown sugar, salt, vanilla, and spices to a boil over high heat. 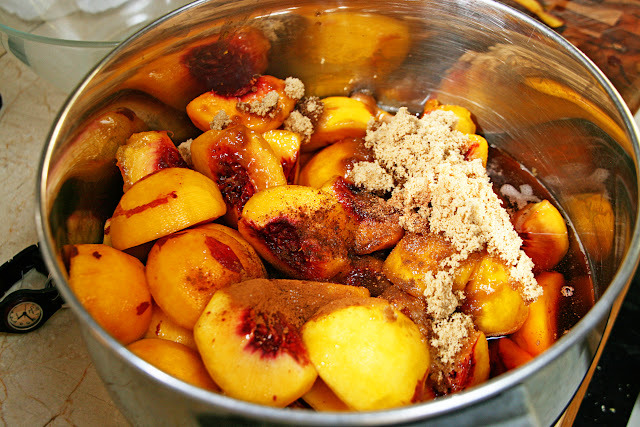 Reduce heat to medium, cover, and simmer about 45 minutes, until peaches are extremely soft. 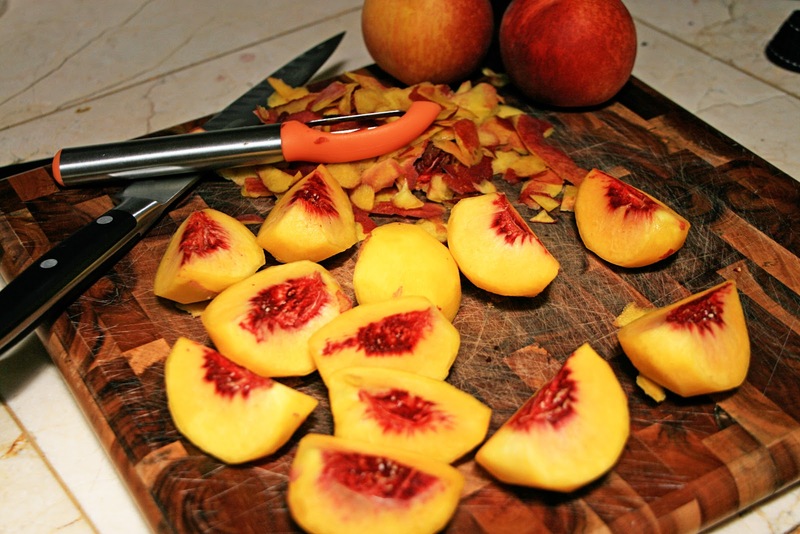 Scoop the peaches out of the pot (reserving the liquid) and transfer to a food processor fitted with the metal blade. Add the habaneros to the food processor and process until pureed and return the peach puree to the pot. Return to a simmer and cook 30 minutes. Skim off any residue from the top with a shallow spoon. Prepare for water-bath canning: wash the jars and keep them hot in the canning pot, and put the flat lids in a heatproof bowl. Ladle the boiling water from the canning pot into the bowl with the lids. 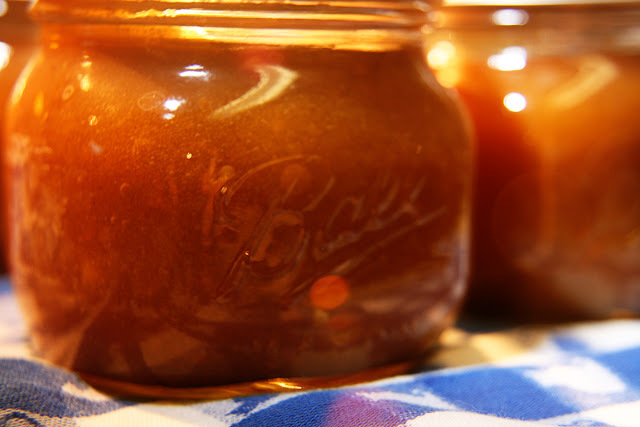 Using a jar lifter, remove the hot jars from the canning pot, carefully pouring the water from each one back into the pot, and place them upright on a folded towel. Drain the water off the jar lids. 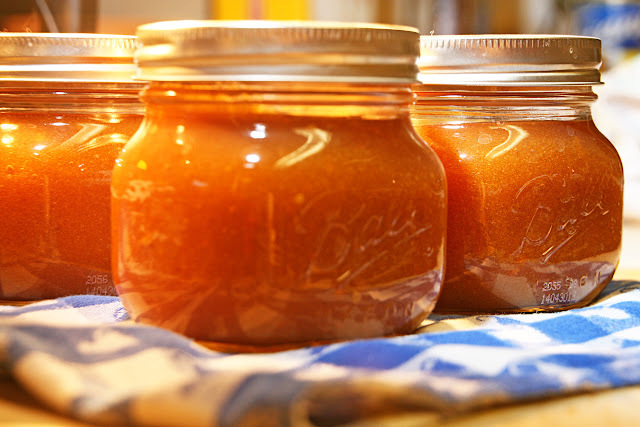 Transfer peach ketchup to hot sterilized 10 1/2-pint canning jars. Use a damp paper towel to wipe the rims of the jars, then put a flat lid and ring on each jar, adjusting the ring so that it is finger-tight. Return the jars to the water in the canning pot, making sure the water covers the jars by at least 1 inch. Bring to a boil, and boil for 15 minutes to process. Remove the jars to a folded towel, and do not disturb for 12 hours. After 1 hour, check that the lids have sealed by pressing down on the center of each; if it can be pushed down, it hasn't sealed and the jar should be refrigerated immediately. 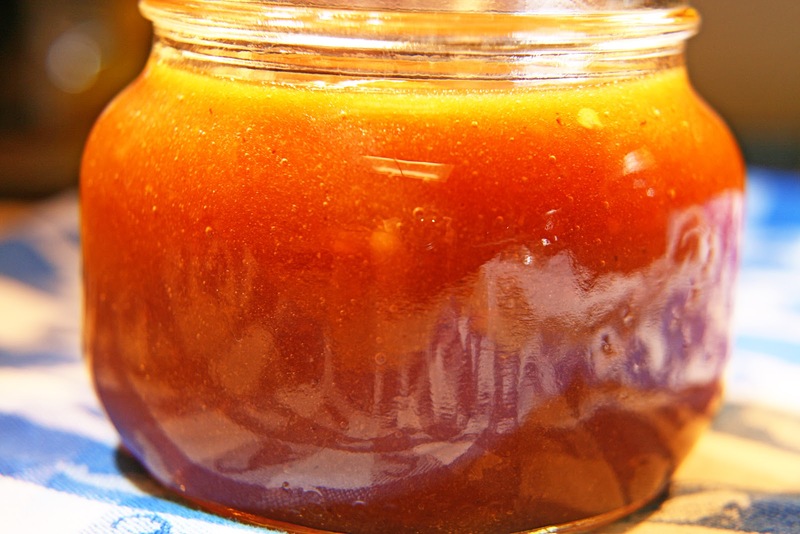 This is golden peachy fire in a jar. Doesn't it look like it? 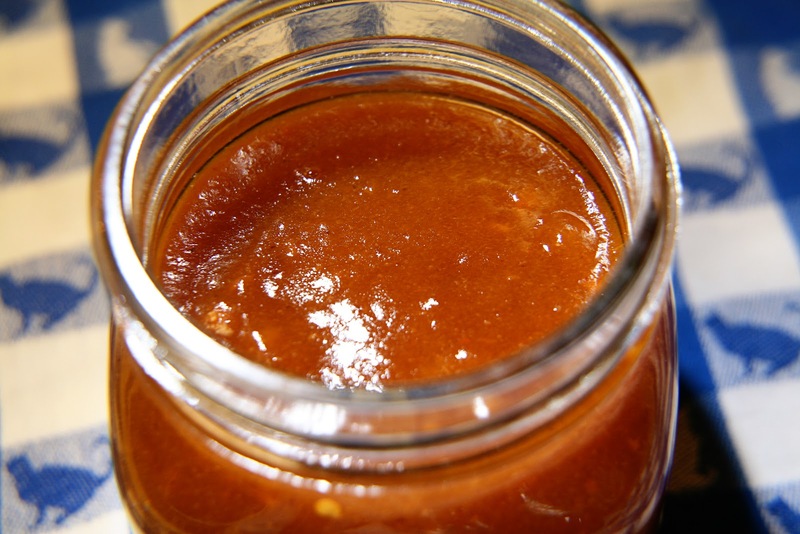 The "ketchup" has a wonderful flavor and can be used with poultry or pork, or with roasted vegetables, or potatoes... or on toast. This is one of my favorite flavor profiles - sweet and spicy. Heck, I'd skip the chicken and eat this with a spoon! Those full jars look beautiful, too. Fantastic! How about linking it in to Food on Friday: Chillies? The seasoning is incredible in this ketchup. Thanks for sharing it on foodie friday. WOW! I really want to try this! I love this idea! Thanks for sharing on Foodie Friends Friday! This sounds VERY good!!! My name is Cindy and I blog over at Vegetarianmamma.com I wanted to invite you to link up your recipe at our Gluten Free Fridays Recipe Link up party! It happens every Friday and we'd love to have you join us with some of your awesome recipes! You can find this week's link up here: http://vegetarianmamma.com/glutenfree-fridays-recipe-party-4/ It doesn't mean that you have to be a gluten free bloggers. If you have some recipes on your blog that are gluten free that counts! :) Many recipes are naturally gluten free. Oh my goodness, those Habanero Peppers will sure put some heat in that Ketchup, it looks awesome! Hope you are having a fabulous weekend and thank you so much for sharing with Full Plate Thursday. That looks great! I just made habanero hot sauce yesterday, and I made a batch of habanero peach jam a couple of weeks ago. I'm starting a new fall blog hop and would love to have you join! I am going to look further into this as I need to use up the peaches that we just harvested. Peaches and pork? That sounds divine! Sounds delicious! What an interesting recipe. am I missing the yield? How many jars do I need? I got 10 half pints and this is so delicious! I'm so glad you like it! This is seriously one of my very favorite recipes. I love heat and sweet together, and it goes with so many things. Sorry I didn't get back to you - I was out of town this weekend - but I am off to update my recipe! Thanks for stopping by and trying my Habanero Peach Ketchup!! Habaneros. Not Just for Salsa Anymore. What's For Breakfast? Maple Biscuit Bites! Tuesday Garden Party - First Week of Fall?